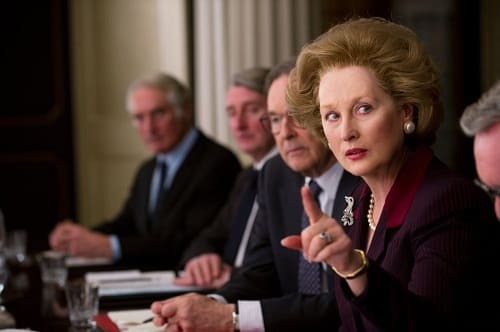 Meryl Streep is without argument the greatest actress of her time and she further cements that point with her role as Margaret Thatcher in The Iron Lady. Portraying a real life individual who was larger than life in the public consciousness is among the most difficult of tasks for any actor. Streep astounds and, in fact, carries the film past the mediocre movie it would have been without her. The Iron Lady is not your typical biopic and for that it should be saluted. This is not a history lesson into the life and times of the first female Prime Minister of the U.K. The film is instead a deeply personal view of one woman and her memories as they become more fleeting. Director Phyllida Lloyd and screenwriter Abi Morgan begin our bio by following the individual who was once the most famous woman in the world as she goes to get a pint of milk. She is old and frail and seems confused at the slightest noise or distraction. We, the audience, immediately recognize her as a much older version of the woman who dominated TV news in the 1980s. Yet, in The Iron Lady, not one soul seems to notice. As she arrives home, her caretakers are in a tizzy that she got out of the house unsupervised. Thus is established the vehicle for which this story will be told: Thatcher as an old woman who is seen being cared for in her home, talking to her long dead husband Denis. The first flashback begins when she finally puts away her husband's clothes after nine years and with each suit she picks up, the memory of her youth is triggered. Lloyd and Morgan have chosen a unique method for telling the life story of one of history’s most compelling women. By establishing our storyteller as someone who is slowly losing their mind, the memories are clear on screen. But one has to wonder if she’s treated as slightly off-kilter by her daughter and hired help, than what are we to make of the memories that are used to tell her story? Many are well documented, but the personal moments left us with a raised eyebrow. But, the filmmakers have so much going for them that The Iron Lady, overall, does work. First and foremost is Streep (could she win another Oscar?). We could watch her recite the alphabet for two hours and it would be a delight. With a character as meaty as Thatcher and her historical legacy, Streep dives in and shows why she is the best of the best. She is Margaret Thatcher. Through her, we see how difficult it was for Thatcher to break into the all-male world of British politics. Not only did she break in, she smashed the ceiling and ruled her entire country. The rest of the cast matches Streep note for note, particularly Alexandra Roach as the young Thatcher. It must have been a tough task channeling Streep for Roach! We do not wish that effort on anyone, yet Roach rivets. Also taking his already A-game even higher is Jim Broadbent as Thatcher’s husband Denis. He provides much of the humor for The Iron Lady and further proves that no one quite nails comical wit like the British actor. The other piece of the puzzle that sets The Iron Lady apart is Thatcher’s story. It would be hard to believe in 2011 that a woman from such humble beginnings would ascend to govern one of the most powerful nations in the world, much less in the 1970s and 1980s. That she ruled with such conviction is also shown in The Iron Lady. Audiences may disagree with her policies, but what is clear throughout the film is that Thatcher is a historical figure unlike any we will ever see again.